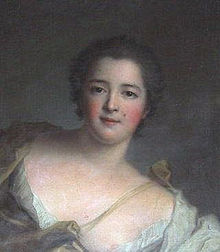 Here is a portrait reputed to be of Diane-Adelaide, known as Mademoiselle de Montcarval before her marriage and the Duchesse de Lauraguais after. This portrait puzzles me. It is exceedingly similar to the portrait that is commonly tagged as being her sister Hortense, right down to the clothes and the face. Also, Nattier would never have painted just a head - so where is the rest of the portrait? Is it possible that that painting of Hortense is actually Diane? Below is an interesting portrait sold at auction, listed as "in the style of" Nattier, entitled "Portrait of a lady (The Marquise de la Tournelle?) as a personification of Daybreak". The head on the right is obviously Marie Anne (see the full portrait here) but what is she doing paired with what is obviously Diane? Marie Anne is painted as daybreak (Aurora), and so I think Diane (or Hortense?) was painted, probably at the same time, as the corresponding sunset or dusk - note the little half moon above her head. I have to confess when writing Diane I portrayed her as slightly more silly than she probably was; she might have been closer to her intelligent and ambitious sisters than I have made her out to be. But she's a lovely character: simple, happy and free of the overwhelming artifice of Versailles life. 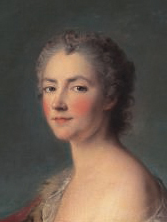 Diane stayed at Court until 1767, eventually retiring after the death of the dauphine Marie-Josephe, in whose service she had been since the dauphine's arrival in France. Diane was reputedly very fat when she died, and very in debt, but it seems she never lost her love of life and her willingness to laugh at herself and others. Diane only had one daughter, a little girl she named Marie Anne in honor of her sister. The child died at the age of 4, after being bitten by a pet dog. So very sad, and understandably Diane was devastated.